HAC (Hearing Aid Compatibility) Test Sequences – Listen, Inc. This pair of sequences tests the hearing aid compatibility of a telephone according to the TIA 1083 and FCC Part 68.316 standards. The sequence begins by instructing the user to set the device under test to the specified volume setting. Once that has been completed, the axial probe should be positioned according to the directions in the standard. A signal generator and multimeter will activate, allowing the user to optimize the placement of the probe for maximum signal level. The user then clicks Continue to begin the main test. A stepped sine sweep from 100 Hz to 5 kHz is played at a level of -10 dBV. The axial response and the axial field intensity of the device are measured and compared against the limits in the standard. There are two limits for frequency response, allowing for the wider tolerances as mentioned in the note of section 4.2 in the standard. The user is next instructed to connect and position the radial probe at zero degrees. The same stepped sine sweep is played, and the radial field intensity is measured and tested against the standard’s limits. This process is repeated with the probe angled at 90, 180, and 270 degrees positions. A final display shows the results of both the axial and radial tests, and the results are saved into an automated Excel report. The TIA 1083 test sequence is similar to the FCC test but includes additional measurements for magnetic interference, including noise and THD. The nomenclature is also slightly different, referring to perpendicular and transverse measurements rather than axial and radial. The sequence begins by instructing the user to set the device under test to the specified volume setting. Once this has been completed, the axial probe should be positioned according to the directions in the standard. A signal generator and multimeter will activate, allowing the user to optimize the placement of the probe for maximum signal level. The user then clicks Continue to begin the test. A stepped sine sweep from 100 Hz to 5 kHz is played at a level of -10 dBV. The perpendicular response is measured via the axial probe, and the perpendicular field intensity is calculated at 1 kHz. Similar to the FCC standard, there are two sets of response limits depending on the perpendicular field intensity level. Please see the TIA 1083 standard for further details. Second, a spectrum of the noise floor is measured via the axial probe. A half band integrator correction curve is applied to the standard, accounting for the typical response of a hearing aid telecoil. The spectrum is also A-weighted and windowed from 100 Hz – 10 kHz. A power sum is calculated over this range and tested against the limit. Next, a 1 kHz sine tone at a level of -10 dBV is applied to the DUT, and the output of the probe is measured. Again, the half band integrator correction curve is applied. The THD is then calculated using harmonics 1-8. Finally, the user is instructed to connect the radial probe for the transverse measurements. The probe is positioned with the aid of the signal generator and multimeter, and the previous tests for intensity, frequency response, noise, and distortion are all repeated. At the end of the sequence the data is displayed and saved into an automated Excel template. Connect the channel 1 (or Left) output of your soundcard to the input of the amplifier. Connect the output of the amplifier to the channel 1 (or Left) input of your soundcard. In the calibration editor under the output tab, select the ‘Amplifier’ signal channel, and click ‘Calibrate device at the bottom of the window. Once the amplifier is calibrated, connect the amplifier’s output to the device under test (via the appropriate interface). Begin by connecting the axial probe to the SoundConnect. (The test will prompt you when it is time to connect the radial probe). Set the SoundConnect’s gain to +40 dB using the front panel switches. 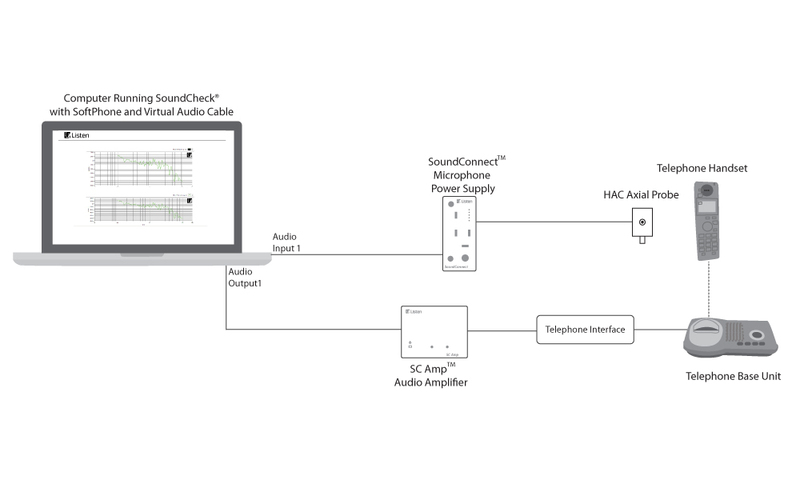 Connect the output of the SoundConnect to the channel 1 (or Left) input of your soundcard. Add 40 dB to your probes’ documented sensitivities, and enter the values into the calibration editor under the appropriate input signal channels (units in A/m/V). Please contact your Listen sales engineer or representative for further information and pricing.